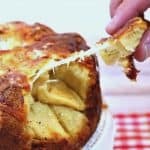 This Incredibly Easy & Cheesy Garlic Monkey Bread bakes in a springform pan and takes advantage of canned biscuits, making for a very delicious presentation which anyone can make. Even a novice in the kitchen can turn out this showstopping Incredibly Easy & Cheesy Garlic Monkey Bread, which only calls for a modest amount of simple ingredients that you probably already have in your pantry and fridge. 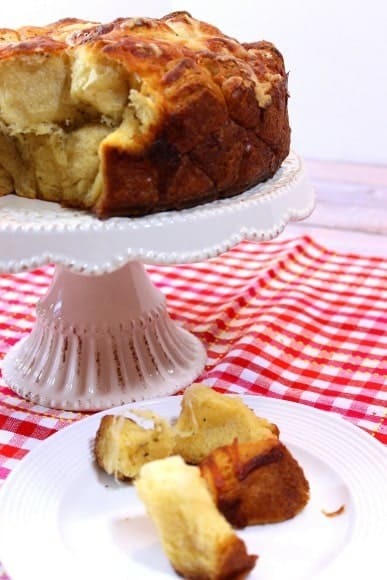 **Please Note – The printable recipe card with detailed instructions and complete ingredient measurements for making Easy & Cheesy Garlic Monkey Bread is available near the end of this post. The short and easy ingredient list for making this Cheesy Garlic Monkey Bread is as follows, and you may already have everything you need already on hand in your fridge and pantry! And if you think the ingredient list is short and sweet, wait until you check out the simple instructions for making Easy & Cheesy Garlic Monkey Bread! Cut the canned biscuits into pieces and put them in a large bowl with melted butter, olive oil, and garlic. Toss the biscuit pieces in the butter mixture to evenly coat. Arrange one layer of the buttered biscuits in a 9″ springform pan which has been sprayed with olive oil spray. Top with dried oregano, basil. shredded Parmesan, and shredded Mozzarella. Layer the remaining buttered biscuits on top of the shredded cheese and top with additional dried basil, dried oregano, shredded Parmesan and shredded Mozzarella. 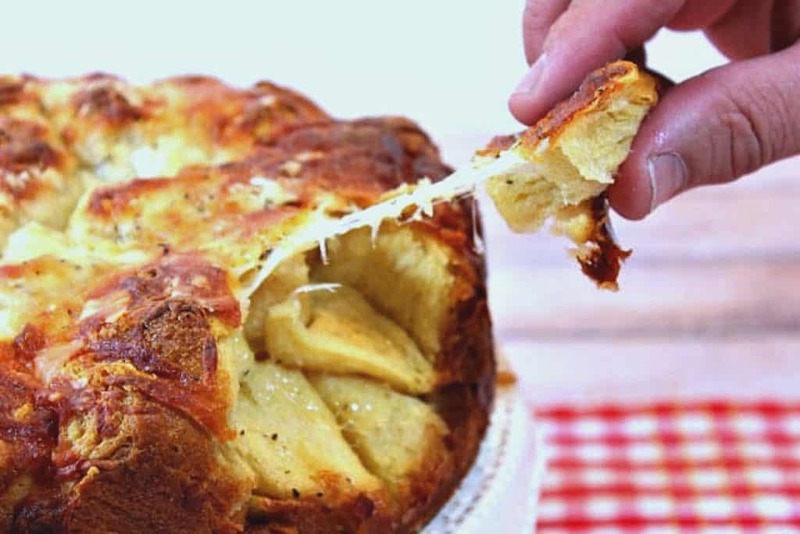 Place the springform pan on a baking sheet and bake the cheesy garlic monkey bread in a preheated 350-degree oven for 40-45 minutes, or until the loaf is golden brown and puffed. After listening and talking with various people lately, I’ve come to realize that the majority of people I’ve heard from don’t especially like to cook or bake. They tend to do it out of necessity, and nothing more. Many would rather have a recipe that takes only minutes to prepare with a minimum of ingredients to deal with, than a recipe that is a bit more challenging and calls for a long list of ingredients. Because I want to bring you recipes that you’ll actually want to make, going forward I’m going to try and bring you more recipes that are quick, simple, delicious, and easy to follow. I’ve developed this recipe for Easy & Cheesy Garlic Monkey Bread with just that in mind. Naturally, if you love to bake homemade bread (like I love to do), you can easily swap out the canned biscuits with your favorite yeast dough to make this Easy &Cheesy Garlic Monkey Bread. The method for assembling this loaf will remain the same after the homemade dough has had its first proofing. This Incredibly Easy & Cheesy Garlic Pull Apart Bread bakes in a springform pan and takes advantage of canned biscuits, making for a very delicious presentation which anyone can make. In a large bowl, toss the cut biscuits in the melted butter, olive oil, garlic, and black pepper. Layer half of the coated biscuits evenly in the bottom of the prepared springform pan. Evenly sprinkle half of the dried oregano, basil, mozzarella, and Parmesan cheese evenly over the biscuits. Evenly layer the remaining coated biscuits on top of the cheeses and sprinkle with the remaining basil, oregano, mozzarella and Parmesan cheese. Place the springform pan on a baking sheet and bake in a preheated oven for 35-40 minutes, or until the loaf is puffed and golden. Remove from the oven and cool for 10 minutes before removing springform pan sides. Serve hot or warm with marinara sauce, if desired. large bowl, cutting board, chef's knife, measuring spoons, measuring cups, small bowl, wooden spoon, 9" springform pan, olive oil spray. I sincerely hope you’ve enjoyed today’s recipe for Easy & Cheesy Garlic Monkey Bread as much as I’ve enjoyed bringing it to you! 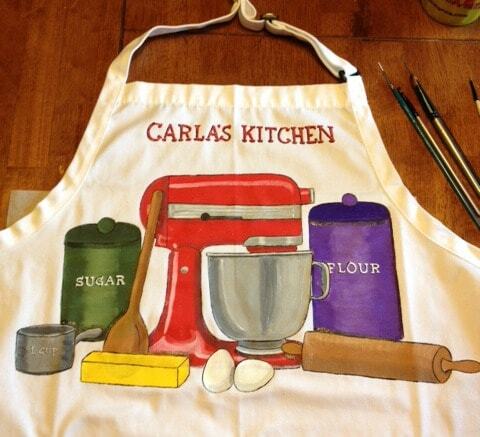 For those of you who DO enjoy baking and spending time in the kitchen, why not add to your enjoyment with one of my cute hand painted aprons? They’re fun, functional and make great conversation pieces as well as gifts. 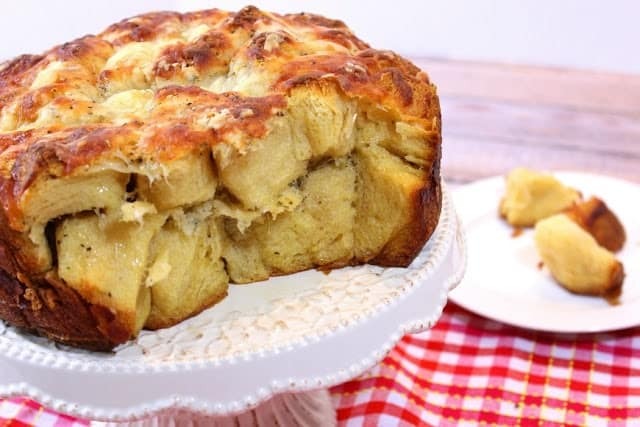 Should you have any questions regarding this recipe for Easy & Cheesy Garlic Monkey Bread, or anything else you’ve seen on my site, please don’t hesitate to contact me directly, or leave me a comment in the comment section below. It is always my distinct pleasure to get back to you with a reply just as soon as I possibly can! cheesy bread…what could be better. I love to cook and bake but I also like EASY so this is much appreciated! That cheese – yum! You are so right – most people do love those easy, comfort food recipes! This will totally win everyone over! Looks fantastic! I love your pull apart bread, but I have to say that I would have a much bigger piece. I just love that you used a springform pan for this recipe. I've done and also seen it with a bundt pan but I'd say the presentation is much better your way. Oh my gosh. This looks SO good! Cheese and carbs is the best combo ever. And with garlic?! Ugh. I want this for breakfast! This bread looks so delcious! You totally captured it in the photos and I'm literally drooling! I love homemade bread but I'm all about using canned biscuits when I can! Look at all of that cheese!! You know, I've never made a pull apart bread? That really needs to change because I could put a serious hurtin' on this one. Cheese & garlic are my favorite bread accessories. You know, I've never made a pull apart bread? That really needs to change because I could put a serious hurtin' on this one. Cheese and garlic are my favorite bread accessories. This just might be the best version of garlic bread ever! It'd be quite dangerous placed in front of me! nice pictures!!! I'd love to taste it. It is a really amazing dish. I am trying this by my self soon. can we use some other oil instead of olive oil? You can use whatever oil is your favorite. I used olive oil to try and stick with an Italian theme, but avocado, canola, grapeseed, or vegetable oil will also work. Thanks for your questions and enjoy the bread!